Well, Indian Dresses designs are not just famous in the Indian fashion market only but it even getting huge popular all over the world. If you will going to look at the Indian culture you will go to find the paramount of elegance and graceful traditional feel in it that simply make it appear as being the center of attraction. It would not be wrong to say that now even the Pakistani designers are trying to copy the styles of the famous Indian designers dresses. Traditional Indian fashion has come into prominence once again. Well, if you notice the trends in fashion industry, you’ll realize that modern Indian fashion has aped the styling and designing of the bygone eras. The creative fashion designers of today are on a lookout for ethnic designs that take us close to our cultural roots and remind us of the glorious past. From shalwar kameez to sarees, Sharara, lehengas to ghagra choli, India has a lot to offer in the fashion world. 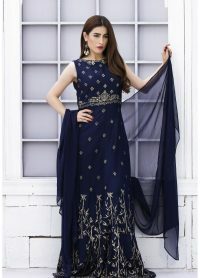 Here we will tell you the numerous style and types of Indian dresses that are famous worldwide and have a special appeal to Pakistani women as well. Indian dresses are gaining mass appeal because of their distinctive style and versatility in the way that they can be worn in functions and events making you look like royalty. Not only Indian clothes are beautiful but they also bring a unique look to the wearer and leave an impact and those who see them.